Girls Sectional game on Saturday at Rend Lake will start 30 minutes earlier than previously scheduled. The game will now begin at 10:15 am. Boys Basketball games at O’Fallon and Wrestling at the Granite City Duals are canceled for Saturday. 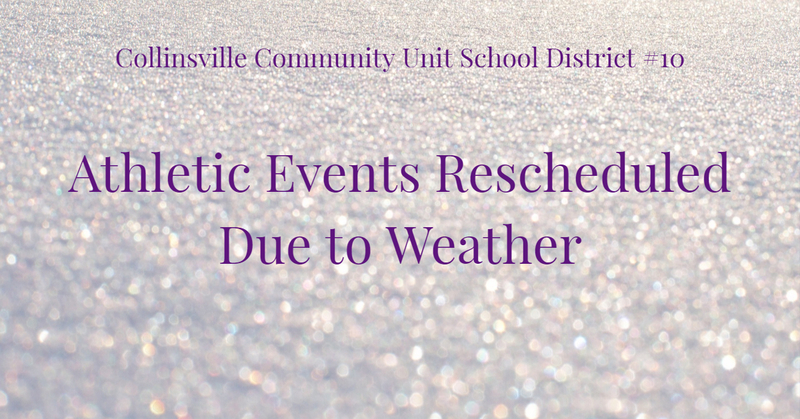 Varsity Wrestling at Ft. Zumwalt has been postponed until Saturday, 1/26. Freshman Wrestling at O’Fallon HS is canceled. The SWC Cheer Competition at Alton HS has been postponed until Monday, 1/21. The Boys Bowling IHSA Sectional at Alton has been postponed until Monday, 1/21. Underclass Freshman/Sophomore Boys Basketball at Edwardsville has been postponed until Thursday, 2/14. The Girls Bowling match at Rockford Guilford has been canceled. The Girls IHSA Dance Sectional at Normal West is on as scheduled. Our team will be leaving tonight at 6 pm to avoid weather. They are prepared to stay tomorrow if needed. All Saturday, January 19, CHS practices are also canceled.